Discussion in 'Dumping and Backing Up Your Games and Prototypes' started by Kao, Jul 20, 2017. 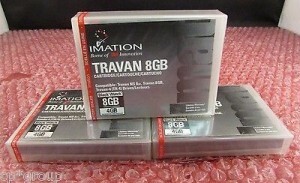 I've got several 8GB Travan data tapes (Imation brand) retrieved from a game developer's old archives from the early 2000s. I'd like to go about reading them and dumping the contents. More modern Travan tape readers that have USB connection are all rated for higher max capacity tapes (e.g. 40 GB). Many of the 8 GB readers that I've found are older and would either have to be installed inside a machine, or use outdated parallel port connections. Any tape drive experts here? Can I use a higher capacity Travan drive to read these older tapes, or do I buy one of the old drives and get an old PC that still has the old ports? Hmm.. So if I find a drive that comes with an install CD/drivers, that may not be enough to read the tapes? There may be some other software dependency on top of all that? Yeah, there are tons of different backup softwares, and they aren't necessarily compatible with one another. *sigh* Why would anyone make things this complicated? Guess I'll just have to try my luck with this drive that I found for sale and hope for the best. Hope this helps a bit but readers for these kind of tapes normally use the SCSI this is a older connection but readily available on sites as ebay. most of this older version of SCSI internal cards use the older PCI interface this is also very nice because..
you can buy a older pc from the pentium 4 age for like 50 dollar? buy a SCSI PCI card on ebay for a few bucks and get the same SCSI cable and SCSI terminator (if needed) and of course the tape reader and your off to a good start! the next problem is that when you insert a tape (any tape) into a tape drive normally nothing happens its not like a USB drive of HDD that windows will find it and address a drive letter to it so you could browse the contents of the tape. normally tapes are used for backup purposes because they are cheap and large in size (storage space) and have a low failure rate if stored correctly! This also means because a tape is normally not readable by a normal windows or linux system you will need specialist tape backup software. There are like a 100+ software suppliers that have backup software available most of them are very bulky an expensive. Next to that you may not know the software that was used this is most likely possible to be found in the header of the tape and there are tools for linux that can lookup this header and you may find more info in there? the next thing is you will need to find the version of the software used this is very important because if a backup on the tape is made with version 1.x.x and you try to access the tape using version 3.x.x most likely this will not work you will have to find a working version of the exact software that was used to make the backup. i hope this clears this up a bit? i would suggest to find a local tape expert that can help you? that would be easier and faster then trying your self? p.s. please don,t get discouraged with my write up and throw them away ? they could contain valuable information! oldengineer and Kao like this. Hey, thank you so much for your detailed write up and help. Fortunately I discovered some old paper records kept by the IT department these tapes originated from. In it I found information about exactly which model of tape drive and backup software was being used at the time. Turns out it was Colorado Backup for Windows 95. I have the drive and the software now, but I don't have a Win 95 machine. I do have a Win 2000 machine with a SCSI cable, but I don't think Colorado Backup for Windows 95 will run on it. You'll have to find an ISO for Win95 which is pretty easy then add a SCSI drive in settings once you make a virtual machine then select the ISO to install. Should work out after that with some trial and error. When I saw the title first thing I thought was Conner backup or Colorado backup and lastly Seagate Backup Exec. The Travan tape drives used the following interfaces from the 90's - 00's. SCSI, IDE or even floppy models. Nully, I didn't realize I could connect a real SCSI device to a virtual machine. So what kind of physical hardware would I be running on? Modern Win 10 PC with VMWare? But modern PCs don't support SCSI, right? So then I can't connect a physical SCSI device. Or do I run a Win 2000 box with a SCSI cable... but can I run VMWare on such an old OS? Let me know what you recommend. I wonder if VirtualBox supports adding a SCSI drive. It's the virtual machine software I'm more familiar with. You will be better to get an older PC with SD-RAM and a PCI SCSI port add-on card. VM will be too much of a headache, and doesn't do real hardware interrupts properly, which will lead to confusion on your end as to whether your problems are hardware or software in nature. Windows 95/98(SE) programs will run nicely under windows xp, if you set the compatibility settings on the install file, and the actual program's execute file. Ain't nothing like the real thing, my man. I can help you set it up, once you have the goods. Thanks, I'll try getting hold of some old hardware, and I'll let you know how it goes. The Travan tape drive uses your standard SCSI connector, but these other tapes I have are for a drive that uses a smaller "SCSI LVD" connection. Hope I'll be able to sort that one out. Man, I don't think I will ever use tapes to back up data going forward. Maybe the tapes are a great storage medium, but the tech to access the tapes doesn't have quite the same shelf life.